Before the recipe, I have to apologize for my haitus – we had a rough week last week with a little family emergency that left the blog on the bottom of my priority list. I’m slowly getting back to it but really haven’t had much time to devote to my kitchen lately (and am quickly running out of stuff in my queue!). Have no fear, I have some new recipes that I want to try soon!! I like cake donuts a lot, but never buy them because they’re not exactly the healthiest breakfast choice. I never make them because that requires deep frying and that’s messy (and again, unhealthy). 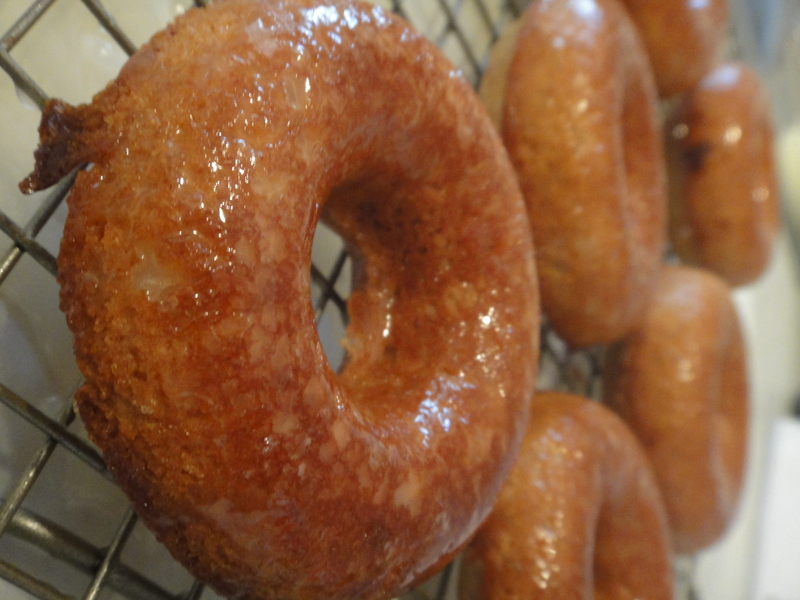 Recently, I’ve been seeing recipes for baked donuts as well as nifty little donut pans. I was intrigued for sure! I’m happy to admit that baked donuts are YUMMY! They’re not quite the same as the fried version, but they’re comparable (especially with the reduction in calories considered). I have some ideas for different flavors and such now that I’ve tried these and seen how easy they are! Stay tuned!!! Whisk together all of the dry ingredients in a medium-sized mixing bowl. In a separate bowl, beat the eggs, oil and water (or buttermilk or yogurt) until foamy. Pour the liquid ingredients all at once into the dry ingredients and stir just until combined. Butter or grease the doughnut pan; non-stick pan spray works well here. Note: even though the pan is non-stick, since the doughnuts are low-fat they may stick unless you grease the pan first. Fill each doughnut form half full. Bake the doughnuts in a preheated 375°F oven for 10 to 12 minutes. When done, they’ll spring back when touched lightly, and will be quite brown on the top. Remove the doughnuts from the oven, remove them from the pan, and allow them to cool on rack. Glaze with icing, or coat with cinnamon-sugar or any non-melting sugar. These look so simple and almost virginal compared to most doughnuts these days. I think doughnuts are always best when kept simple. Brilliant! Hope everythings better now. These look great. I hate the fried kind.